I spent years being afraid of potato salad. It wasn’t until my mom came across a recipe that used mustard instead of mayonaise (probably from Gourmet or Bon Appetit) that my tides turned. (I’m not anti-mayo at all, but it always seems to overtake the potatoes.) Since then I’ve added a few standbys to my repertoire, including this potato salad fra diavolo from Rachel Ray and spring salad with new potatoes from Smitten Kitchen. I’ve always followed those recipes pretty closely, but recently have embraced potato salad as something I can just play around with and adapt to the season and my fridge. This is a basic version, and the only non-pantry item is the herb. I used dill because I had some to use, but chives/scallions, parsley, or basil would all work. This may seem like a lot of dressing, but it gets quickly sucked up by the hot potatoes. What made this version extra special was the pickled garlic scapes my sister made, but any pickle would work (or even olives or capers!). If I was bringing this to a party I would double or triple it, but this amount was perfect for casual weekend lunches. Prep a small bowl with ice and water. Wash the potatoes and chop them into ½ inch pieces. Cover them with cold water, and bring to a boil. When they have reached a boil, set a timer for 5 minutes. When the 5 minutes are up add the eggs to the water with the potatoes, and cook for another 10 minutes. Check the potatoes for done-ness with a fork (it should easily slide through) and drain the whole pot. Place the eggs in the ice water. While the potatoes are cooking whisk the mustards, olive oil, pickle brine, salt, and pepper in the bottom of a large bowl. After the potatoes have drained and cooled slightly, add them to the bowl with the dressing and toss to coat. Peel the eggs and dice them. 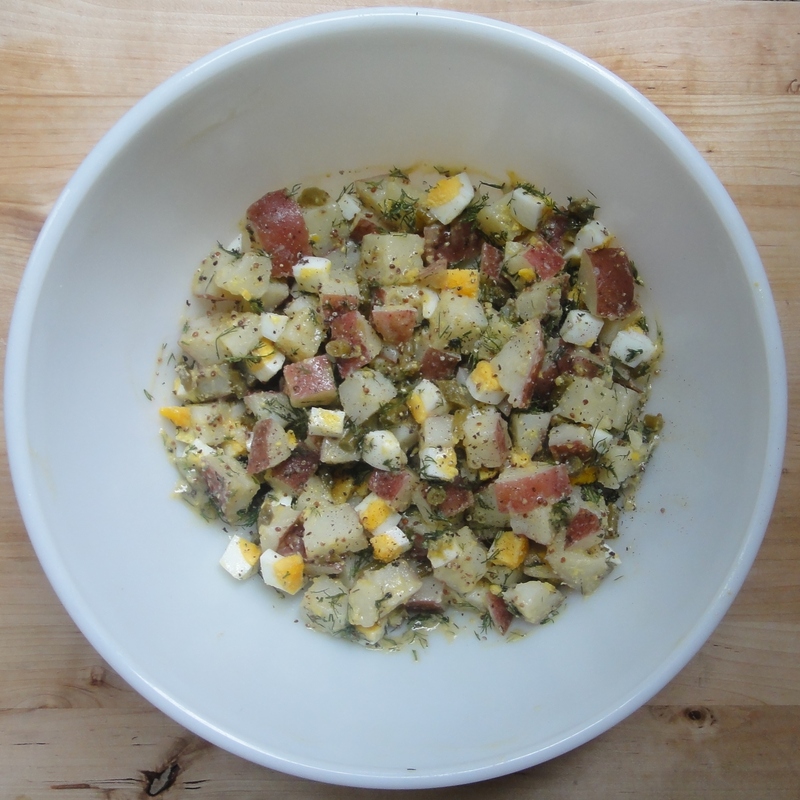 Add the eggs, chopped pickles, and chopped herbs to the potatoes and toss again to combine. Taste and adjust as needed.